Someone needs to go back to Kindergarten for calendar time… Yesterday I announced that in exactly 7 months I’d be running my first full marathon. In exactly 7 months, I’ll actually be at my sister’s wedding. Whoops! Equally as exciting, but not the same thing. The 2014 Chicago Marathon is actually on October 12, making it less than 7 months away! Okay, that’s still a ways away, but I’m sure time will fly (whether I’m having fun or not). Today I felt pretty motivated about my workout. I had a great day at work and when I got out, it was a lot warmer out than I expected it be. I hadn’t really planned any workout per se, I just wanted to do something. There’s no avoiding it now, I’ve gotta stay in shape! I decided to keep it simple and go for a run in the ‘hood. (AKA South Hammond). You can imagine my excitement when I realized that there was no more snow on the sidewalks! I took off fast and kept on going. If weren’t for a midrun phone call, my pace would have been just over 9 minutes per mile. I ran 3.15 miles total in 30 minutes on the dot. Not too shabby! Especially since I was once again experiencing asthma-like symptoms. This afternoon, I wanted to experiment a bit to see when I start having symptoms and if anything lessens them. I’m going to try tracking this for a few weeks before going to a doctor because I’d rather not be on meds or have to use an inhaler. I’m also planning on doing some research on breathing and lung expanding exercises. With the popularity of natural medicine, there’s got to be something I can do without meds right? Back to my workout, after my run I popped in a Pilates DVD I’ve had forever and did the 10 minute arm toning portion. Big problem. I’m totally inflexible and I my hand weights aren’t heavy enough anymore. So I guess that’s one little problem, and one good problem. I didn’t feel like it was that great of an arm workout, so I’ll be scouring Pinterest soon to find some 10-20 minute weight sessions. And I’ll be investing in some 5 lb hand weights. My eating has been sort of okay lately. I haven’t been worrying about calories too much, just really watching my portions. I still have a major sweet tooth I need to deal with. But with training for a new job and an extra little side project in the works, I don’t really have the mental strength to focus on my sugar intake. I’ll get back there eventually. Yesterday, I made a turkey breast in the Crockpot, roasted red potatoes, and a side salad for dinner. I even made my own dressing. It was delicious! Tonight’s dinner was “tacos”. I feel like tacos aren’t really tacos when you add beans and veggies to them, but my Mexican husband assures me that they can still be considered tacos. 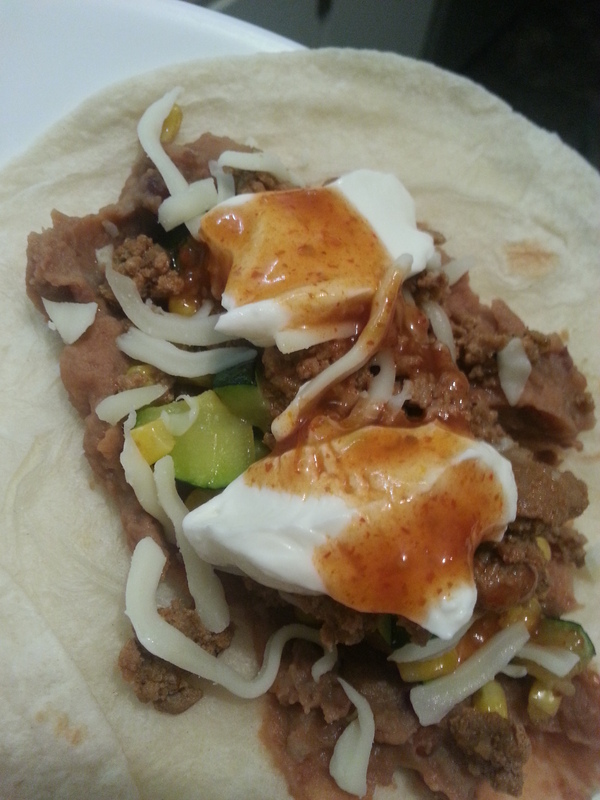 So we used flour tortillas, and added refried beans, taco meat (with my own seasonings instead of the packet), sauteed zucchini and corn, shredded cheese, Greek yogurt (in place of sour cream), and medium taco sauce. I had two. Since I only had a bowl of cereal with almond milk for breakfast, and a banana with a blueberry muffin Larabar for lunch, I think my dinner was just right. I realize this may look fairly unappetizing, but I promise, it was fantastic! All in all, a good start to the week! What meals do you have planned this week? Any suggestions for my asthma symptoms?